A listing of all the articles written by Jason Collette for the RotoWire Blog. This year was my 13th year traveling to New York City for Tout Wars. The highest finish I own is a distant second place finish, and that annoys me greatly. I put in a tremendous amount of pre-planning for this auction every year, but the end result is never as good as I want it. Part of the problem is undoubtedly my in-season management as I am notoriously too cautious early in the FAAB process, or I stupidly cut Francisco Lindor two weeks before he was promoted to the big leagues so I could roster a backup catcher. This year, I tried something different, but not by choice. If you would like to see the complete draft results, in order, click here. I missed out a few targets later in the draft, including Chris Johnson who I have been able to safely get in every draft I’ve done this season. Now that he is hitting cleanup, the RBI and average potential are there and I ended up with power upside but average downside in Reddick and Rasmus around him. Oh well. The fact he went 226th after starting the season with an ADP in the 300’s makes me happy. Do You Have To Spend It All? This was the email I received today from a friend. He and I have played in home leagues together for quite some time now, and I’ve always found him a challenge to draft against because he is tough to read. He also ends up taking a lot my reserve targets in that part of the draft each year! Everything I read says it is important to spend your entire budget at the draft. What I don’t understand is why. I don’t dispute the notion it’s just that I have a hard time reconciling bargains or under value pickups with over spending just so you can use all your money. More than once I’ve left money on the table and been the subject of ridicule so that I feel I’ve lost before the first game has been played. However I should point out that recently I won a league without spending my entire budget. Does the dynamics of keeper league’s affect this at all. When is over spending for the sole purpose of spending your budget okay? For example If I have have a Cabrera valued at $50 and the bidding goes to $60, should I keep bidding because I have the budget it for it or should I look for something elsewhere? I am not as adept as a lot of players in fantasy but growing up around New York City poolrooms thought me that you have to pay to learn so I don’t mind paying and losing. As long as I am learning. This is one concept I can’t get my mind around and would really appreciate any help you might be willing to offer. I enjoy the game and would just like to be more competitive, make less mistakes etc. There are some excellent questions here. Let’s look at each one separately. Why do I have to spend all of my money? In a reset league, the simple answer is that you cannot take that money home with you. Bargains at the draft are always great, but if your team is completely full of bargains and you still have some money left over at the end of a reset league, you either have an issue with the dollar values you are utilizing, or the rest of your league mates do. If you end a draft with a few bucks left over, it is one thing. If you get to your final three slots with $30-$60 left over, which I witness happen twice in Tout Wars this weekend, you have an imperfect storm of poor execution and issues with your dollar values. Does the dynamics of a keeper league affect this at all? Absolutely, it does. Keeper leagues present inflation, which makes all standard published dollar values the starting point for research rather than the final answer. You have to get your keeper lists, and then see how much value out of the talent pool is being protected in order to know how much to inflate the dollar values of the players available. In a keeper league, you buy what fits your plan. If your plan is a two to three year plan, buy accordingly. Last season in a league he and I play together in, I had a rather poor keeper list and I quickly figured out once the guys I really wanted were going several dollars over my projections, I punted the season at the draft. For example, I wanted Matt Kemp at $45. He went $51. The first five guys I wanted each went at least $6 more than I had projected. I decided to let people spend their money and then bought mid-tier guys for the sole purpose of trading for better keepers. I ended up trading for Billy Hamilton, Gregory Polanco, Archie Bradley, and Eddie Butler in this league while also landing Anthony Rendon, Andrelton Simmons, and a somewhat cheap Hanley Ramirez. It put my keeper list for 2014 in much better shape and rather than chasing multiple numbers, I was able to chase a more narrowed skill set in my most recent auction. When is over spending for the sole purpose of spending your budget okay? This is never OK in a keeper league. You are buying a player for multiple years, so there is no reason to throw a lot of money on your final players simply because you have it. If you walk away from a keeper league auction with money on the table and you have hit your categorical targets that you wanted to hit, job well done. If you fell short, and left money on the table, you can play the couldawouldashoulda game and figure out who you may have landed had you gone the extra dollar or three. In a reset league, this depends on the rules. Early in an auction, if you have Cabrera at $50 on your sheet and are also the high money man by $10 or more dollars, you do not need to give up the high ground simply because you have the advantage. You can, and let people drive you up or stick them with the player, or you can wait and buy two $30 players later when others will be powerless to stop you. You are not fooling anyone if you throw down your final $15 on a second catcher or a middle reliever because you had the money. The critics are still going to find issues with your roster. In Tout Wars, we have rules that allow you to reclaim a player’s auction salary in FAAB dollars. Yesterday, a Tout Wars owner dropped $61 on Brandon Beachy to salvage his draft and will get to reclaim that as FAAB giving him 60|PERCENT| more FAAB dollars to play with throughout the season. He can trade that money, or he can spend that money to help improve the holes in his team. Outside of those two reasons, if you are the high money owner on the board two-thirds of the way through a reset auction, ignore your dollar values and buy the players that you most need to get as close to your categorical benchmarks as possible. In the end, auctions all come down to being confident in your dollar values and not letting others muscle you around. Keeper auctions are three year plans and dollars saved in year one are dollars earned when you get to that third year and have to decide whether or not to extend that player. If you threw $15 down on Glen Perkins three years ago because you liked him as a middle reliever and did not want to be ridiculed for leaving money on the table, you would likely be letting him walk after this season rather than extending his contract. It is your team, it is your auction dollars, and it is your real dollars you are paying to play in the league. Be diligent with the fake money and the real money will come sooner rather than later. Monday night, I participated in a FSWA draft named after me, which they do for their annual award winners. That was not the coolest part of the draft as the best part was the league format. The rules drop batting average, home runs, and wins and replace them with on base percentage, slugging percentage, and quality starts. I love the format and wish it were more mainstream. 28 players overall; 14 reaches, 12 profits, 2 spot on picks. Three of the five reaches were on the closing side of the fence, which can happen in a 12-team mixed league where closers are plentiful. I waited to take my closers until the 14th round and still like what I ended up with in terms of those guys getting me saves. I was surprised to get two pitching values in Estrada and Quintana when I did in the draft, especially Quintana who made strong strides in the second half of the season. While Bogaerts was a large position player reach, there was quite a number of upset drafters when I took him where I did during the draft. He is a wild card, but he has the skills to be a top 150 player when it is all said and done. Some of the later reaches were done while pursuing production to get to my benchmarks. Erick Aybar was not my favorite MI selection when I made it, but I needed more steals and it was my last non-catcher pick remaining. The lack of strikeouts will be addressed by putting Quintana into the rotation over Qualls should he not hold the closer role, but I feel very good about the offense. Now, I just hope I do not finish poorly in my own league! I have to admit this up front – I have an irrational love for Aramis Ramirez. He is one of just six players that are currently in a Spring Training camp with a career slugging percentage of at least .500 joining Albert Pujols, Miguel Cabrera, David Ortiz, Alfonso Soriano, and Jason Giambi. In 6 of his past 11 seasons, he has earned at least $20 in single-league formats for players. Over the past five seasons, only Evan Longoria has been more productive offensively at the hot corner. Longoria has a .371 weighted on base average in that time while Ramirez is tied with David Wright at .368. He also comes with flaws. He has not played in as many as 150 games since the 2006 season. He has missed time on the disabled list in recent years with multiple knee issues, a shoulder dislocation, and hand problems. He also turns 36 years old this summer and that’s in the danger zone of the aging curves that Jeff Zimmerman of Fangraphs recently discussed. A combination of those flaws outweigh his historical production as he is currently the 11th third baseman in terms of ADP in the latest NFBC Average Draft Positions rankings. I am a bit surprised that Ramirez is going 40 picks after Machado, who is coming off a major leg injury. The latest report from Bob Nightengale of USA Today was not terribly positive about Machado being ready to start the season. If we continue to walk that timeline back, we see that Machado is still not even cleared to resume all baseball activities just yet. It is one thing to assume an injury with the older Ramirez, but we know Machado is going to miss some time in April and that also required a leap of faith that he won’t miss any more time the rest of the season to help make up the gap. If we use the composite projections that our friend at Fantasy411 posted the other day, Ramirez is quite the bargain if he continues to be drafted outside of the top ten at the position. 11th in ADP, but 8th by roto value based on the composite projections. He comes out ahead of Machado, even with the aggressive playing time projection against the news that he is not going to be ready to start the season. Simply put, Ramirez is currently being undervalued by the overall community. In the three expert drafts I have either participated in or observed, Ramirez has been gone by pick 130. Perhaps some more attention and love from the experts will drive up his ADP as we get closer to the heavy part of the draft season. The signing of A.J. Burnett by Philadelphia was one that was met with as many shaking of heads as it was nodding of heads. On the heels of the news that Cole Hamels was experiencing bicep tendonitis, adding Burnett makes sense if the Phillies think they are a playoff contender. The problem is, they certainly do not appear to be a contender, even within their own division, on paper. The other problem is that Burnett could not have picked a worse location for his skillset. Burnett goes from a park that suppresses offense, PNC Park, to one that inflates it in Citizens Bank Park. The much larger issue is the change in defense. One of the things the Pirates did with Burnett after acquiring him from the Yankees was to get him to use his two-seam fastball more often. The two-seamer quickly became a weapon for him as it allowed him to generate groundballs at a near-career best rate. In two seasons with Pittsburgh, Burnett had groundball rates of 56.9|PERCENT| and 56.5|PERCENT|; only his 2005 effort with the Marlins was higher. The increased groundballs played right into the strength of the Pirates as an increased emphasis on defense allowed them to turn around their team defensive efficiency from the league’s worst in 2010 to the fifth best this past season. In 2010, the Pittsburgh defense gave away 77 runs on defense; in 2013, they saved 68 (via Baseball Info Solutions). The Pirates saved 24 runs on the infield with their shifts, which was the 7th-best total in all of baseball and the 3rd-best in the National League behind the Dodgers (38) and the Rockies (28). Conversely, the Phillies were the worst in both situations as their infield defense costs the team 50 runs in 2013. Jimmy Rollins, Michael Young, , Cody Asche, Freddy Galvis and the other players that played the left side of the infield accounted for 42 runs lost on defense. Michael Young was the worst at third base in the league with -20 runs and Rollins was the fourth-worst at shortstop with -15 runs. Three of the four members of the last-place defense return and Young is replaced with Asche, who is more known for his offense than his defense. The other part of this equation is who Burnett will be throwing to. In 2012, Burnett threw all but 8.1 innings with Rod Barajas behind the plate. This was done mainly because Burnett is slow to the plate and the other catcher, Mike McKenry, was a poor thrower. Barajas was one of the worst catchers in terms of framing pitches as he was 12.9 runs below average. That season, Burnett had 34.2|PERCENT| of his pitches called for strikes. Last season, Burnett threw almost exclusively to Russell Martin, who was one of the best pitch framers in the league at 15.8 runs above average. Burnett saw his percentage of called strikes jump up two percentage points to 36.3|PERCENT| and Burnett finished 2013 with a career-best 3.30 ERA and his lowest WHIP since 2007. Now, he moves to Carlos Ruiz as his primary catcher, who was six runs below average in 2013 after finishing five runs above average the previous season. Ruiz ranked 36th out of 47 catchers last season in generating called strikes; Martin ranked 23rd. On converting pitches out of the strike zone into called strikes, Ruiz ranked 38th while Martin ranked 20th. The ballpark, the defense, the receiving; all signs point to a tougher season for A.J. 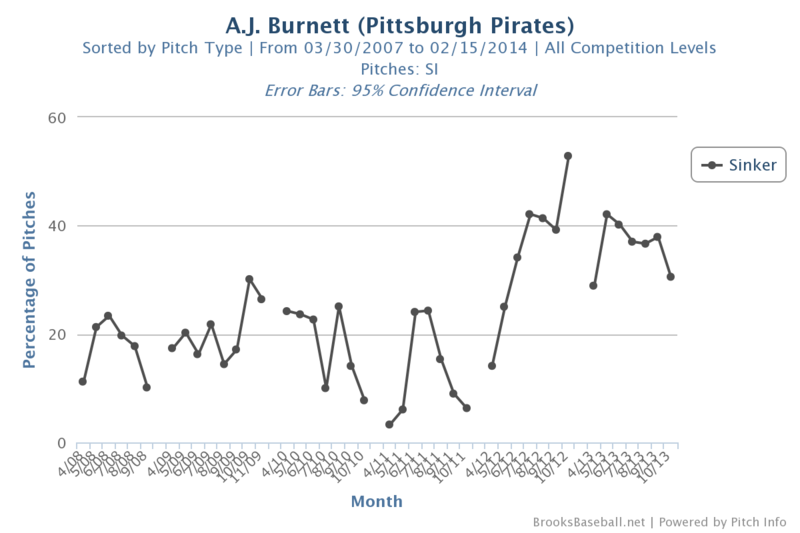 Burnett in 2014 compared to what he has done the previous two seasons.